Few if any men have changed the course of history like Martin Luther. In less than ten years, this fevered German monk plunged a knife into the heart of an empire that had ruled for a thousand years, and set in motion a train of revolution, war and conflict that would reshape Western civilization, and lift it out of the Dark Ages. Luther's is a drama that still resonates half a millennium on. It's an epic tale that stretches from the gilded corridors of the Vatican to the weathered church door of a small South German town; from the barbarous pyres of heretics to the technological triumph of printing. It is the story of the birth of the modern age, of the collapse of medieval feudalism, and the first shaping of ideals of freedom and liberty that lie at the heart of the 21st century. But this is also an intensely human tale, a story that hurtles from the depths of despair to the heights of triumph and back again. This is the story of a man who ultimately found himself a lightning conductor of history, crackling with forces he could not quite comprehend or control. For Luther, in a life full of irony, would find himself overwhelmed by his own achievements. As his followers sought to build a new and just Europe around him, he could only turn on them in frustration, declaring that his - and their - only goal should be Heaven. Martin Luther stands as a hero, the man who built the bridge between the two halves of the last millennium, the Medieval and the Modern. His tragedy was that he would never find the courage to cross it himself. Martin Luther was born into a world dominated by the Catholic Church, which holds spiritual dominion over all the nations of Europe. For the keenly spiritual Luther, the Church's promise of salvation is irresistible - caught in a thunderstorm, terrified by the possibility of imminent death, he vows to become a monk. 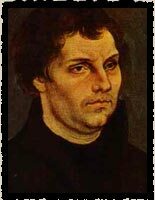 But after entering the monastery, Luther becomes increasingly doubtful that the Church can actually offer him salvation at all. His views crystallize even further with a trip to Rome, where he finds that the capital of Catholicism is swamped in corruption. Wracked by despair, Luther finally finds release in the pages of the Bible, when he discovers that it is not the Church, but his own individual faith that will guarantee his salvation. With this revelation, he turns on the Church, attacking its practice of selling Indulgences in the famous 95 Theses. The key points of Luther's theses were simple, but devastating: a criticism of the Pope's purpose in raising the money, "he is richer than Croesus, he would do better to sell St Peters and give the money to the poor people...", and a straightforward concern for his flock, "indulgences are most pernicious because they induce complacency and thereby imperil salvation". Luther was not only a revolutionary thinker, he would also benefit from a revolutionary technology: the newly invented machinery of printing. A single pamphlet would be carried from one town to another, where it would be duplicated in a further print run of thousands. Within three months, all Europe was awash with copies of Luther's 95 Theses. Martin Luther had inadvertently chosen unavoidable conflict with what was the most powerful institution of the day, the Catholic Church. Find out more about the Characters in Luther's life. You will need Real Media Player to view, download free here.